An international who's who of global leaders is scheduled to meet in Washington, D.C., on Wednesday to discuss with the Trump administration next steps to deal a death blow to the ISIS terrorist group and thwart the Iranian regime's military intervention across the Middle East, according to senior State Department officials. Leaders from 75 nations and four international organizations will gather at the State Department for meetings with Secretary of State Mike Pompeo and other high-level Trump administration officials as the global coalition plans its next moves in the ongoing fight against ISIS. Iran is expected to be one of the primary topics of these meetings as international allies coalesce around a policy of isolating the Islamic Republic and working to stop its support for international terrorist groups, particularly those backing embattled Syrian president Bashar al-Assad. In all the discussions centered on ISIS, Iran has emerged as a "key" source of frustration and worry, according to senior State Department officials. "I think the Iranian presence in Syria at least is something that's of ongoing concern to us, and it is part of a pattern of malign Iranian behavior throughout the region that destabilizes nation-states like Iraq and allows the conditions for ISIS to fester," according to one senior official, who would speak only on background. "That's really the key here." "No one—it's so prominent that no one can ignore it, and it's why one of our three overarching goals in Syria is to see the exit of all Iranian-commanded forces from all of Syria because of the way in which they are an accelerant to the local conflict in Syria, they're an accelerant through their provocative actions to a potential regional conflict, and they're destabilizing to regional and even international security," added a second senior State Department official, who also spoke only on background. With ISIS on the ropes, having lost around 99 percent of its so-called caliphate under the Trump administration's leadership, Iran's support for terrorism and its increasingly provocative military moves are foremost in the mind's of many global leaders. "In every discussion we have about the strategic situation in Syria, there is a thread of the destabilizing and provocative role that Iran plays in Syria," said the second official. "When we're talking to the Small Group, when we're talking to others outside the Small Group, it's a constant theme. So for sure Iran is a constant theme in these Syria discussions." Wednesday will mark the 10th ministerial meeting of the global coalition to defeat ISIS, which has grown to 79 members from just 12 in 2014. U.S. officials said this gathering would be critical in terms of policy, but also funding resources for the fight. As the United States winds down its military operations in Syria, the Trump administration has been clear that other nations—particularly Arab allies—must pick up the slack, with both money and forces. "It comes at a critical time in our mind because we're near the end of the military operations against Daesh and as you—as has been announced, U.S. troops will be departing Syria," said one of the State Department officials. "So we're entering a very critical phase in which we need to expand the diplomatic cooperation to assist the populations in Iraq and northeastern Syria recovery from Daesh's rule but also maintaining the significant pressure on ISIS as it increasingly turns to insurgent tactics to destabilize both northeastern Syria and Iraq." The end of military operations, however, does not mark the end of the fight, officials said. "The territorial defeat of Daesh in Iraq and Syria will mark this significant milestone against the war against ISIS, but we really have been clear that it doesn't mean that our campaign against them—them being Daesh—is over, and both the president and the secretary have been forceful in saying that we will do what is necessary across the globe to ensure that defeat," according to the State Department official. 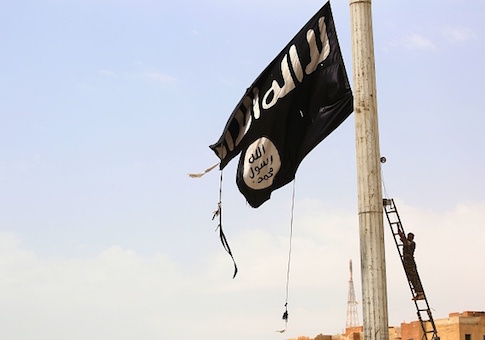 There is concern that a diminished ISIS will still be capable of launching terror attacks as it morphs into an organization more closely resembling al Qaeda, which has been diminished in strength but still retains the ability to organize terrorist strikes. The "U.S. is not saying that ISIS is eliminated as a threat," a U.S. official said. "In fact, that's why we've continued to say that our overarching goal is an enduring defeat of ISIS. What we are saying is that we're on the cusp of the end of the territorial caliphate that ISIS enjoyed not that many months ago, where they were governing territory, enslaving people, taxing people, conscripting people from almost northeastern Syria all the way over to the Tigris Valley in Iraq." "So that is what is coming to an end, but we're not intending to let up on the pressure on ISIS as it evolves into a different kind of threat, the kind of threat that we've seen from, for example, al Qaeda in Iraq in the past," the official added. "So that's why we're going to continue to work through the coalition partners and other local forces to make sure that we can bring about an enduring end to that threat." This entry was posted in National Security and tagged Iran, ISIS, Mike Pompeo. Bookmark the permalink.